In this week’s edition of Watt It Takes, Jigar Shah opens up about his life and career, as well as the origins of SunEdison. Plus, he’ll give plenty of tips for entrepreneurs. Jigar Shah talks with Emily Kirsch for the Watt It Takes live podcast series. In the early 2000s, investors weren't very interested in SunEdison's business plan to finance solar with power purchase agreements. "No one wanted to hear about physical infrastructure," said Jigar Shah, who drafted the business plan and co-founded the company. It took until 2006 to raise venture capital. But soon after, PPA customers started rolling in: Staples, Ikea, then Whole Foods. "It was an idea whose time had come," said Shah. Today, the PPA is now the backbone of solar. 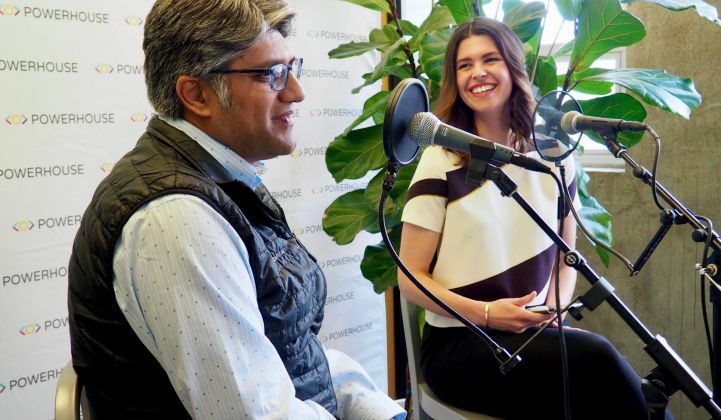 In this week's edition of the live podcast series Watt It Takes, Shah sits down with Powerhouse CEO Emily Kirsch to discuss his career in solar -- from Astropower to the Department of Energy to BP Solar and, eventually, to founding (and selling) SunEdison. Jigar talks about why he left SunEdison, why he thinks Goldman Sachs was a terrible board member, and why cleantech entrepreneurs are taking really dumb money. Like our shows? Make sure to give The Interchange and The Energy Gang a rating and review on Apple podcasts. And make sure to subscribe to both shows on Apple podcasts, Google Play, Stitcher, or anywhere you get your podcasts.